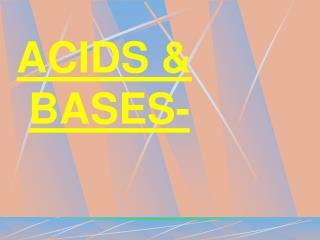 Acids & Bases. 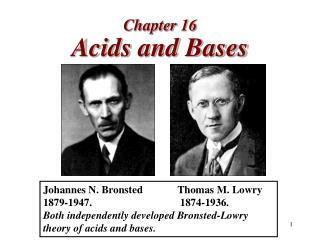 They are everywhere.. 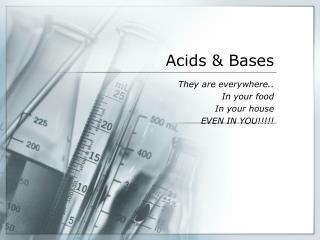 In your food In your house EVEN IN YOU!!!!!. 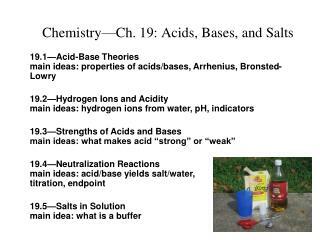 What is an acid?. 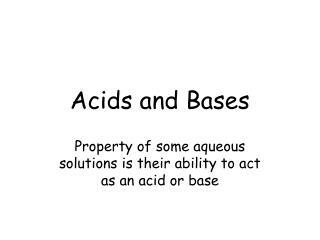 An acid is a solution that has an excess of H+ ions. 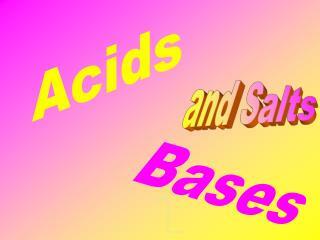 It comes from the Latin word acidus that means "sharp" or "sour". 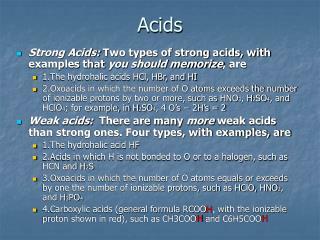 The more H + ions, the more acidic the solution. 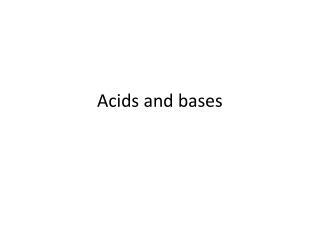 Properties of an Acid. 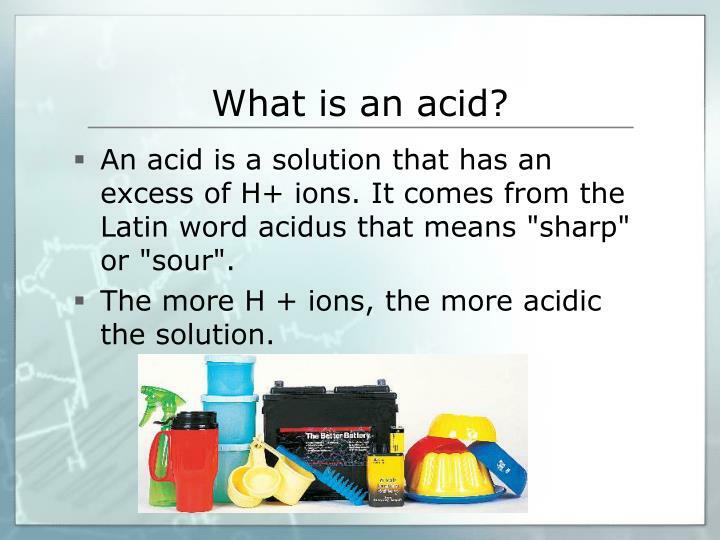 An acid is a solution that has an excess of H+ ions. 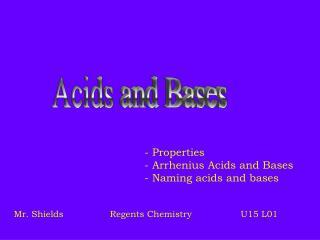 It comes from the Latin word acidus that means "sharp" or "sour". 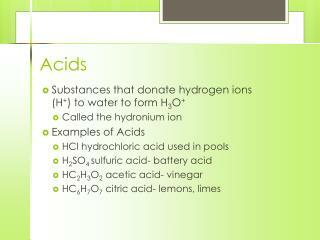 The more H + ions, the more acidic the solution. 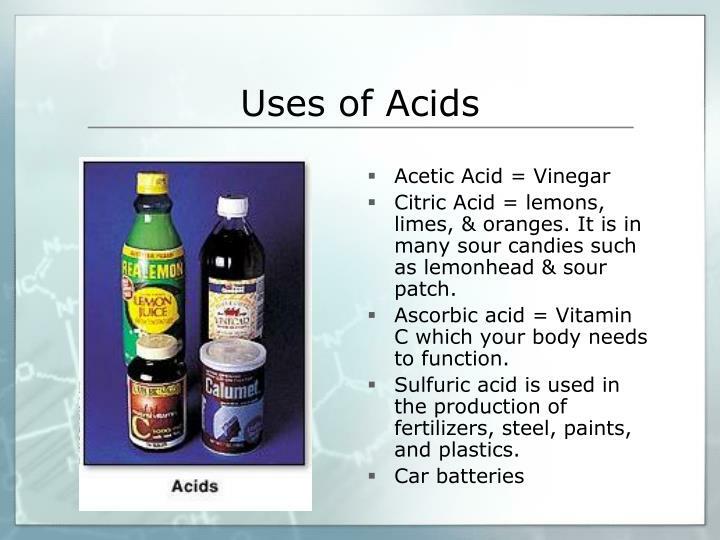 Citric Acid = lemons, limes, & oranges. 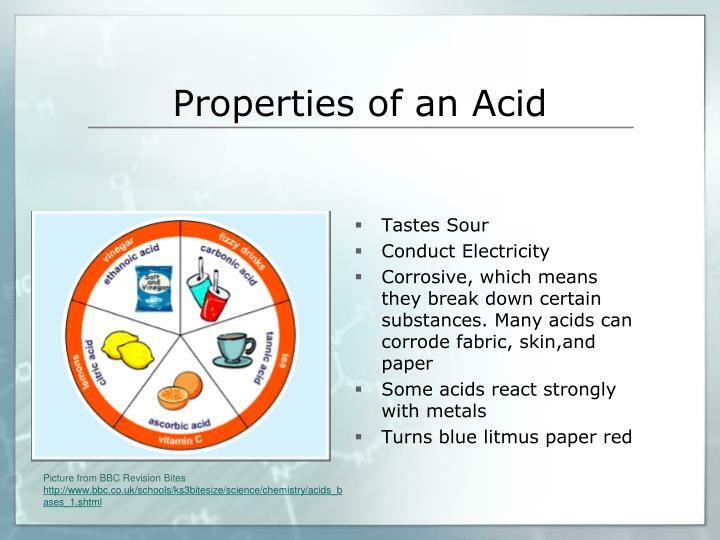 It is in many sour candies such as lemonhead & sour patch. 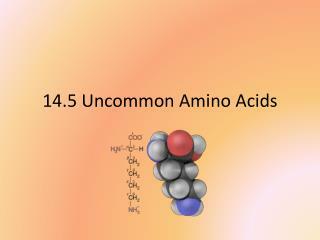 Ascorbic acid = Vitamin C which your body needs to function. 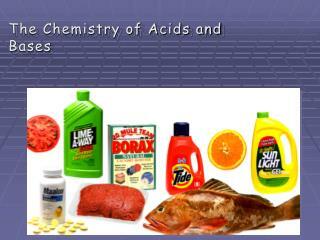 Sulfuric acid is used in the production of fertilizers, steel, paints, and plastics. 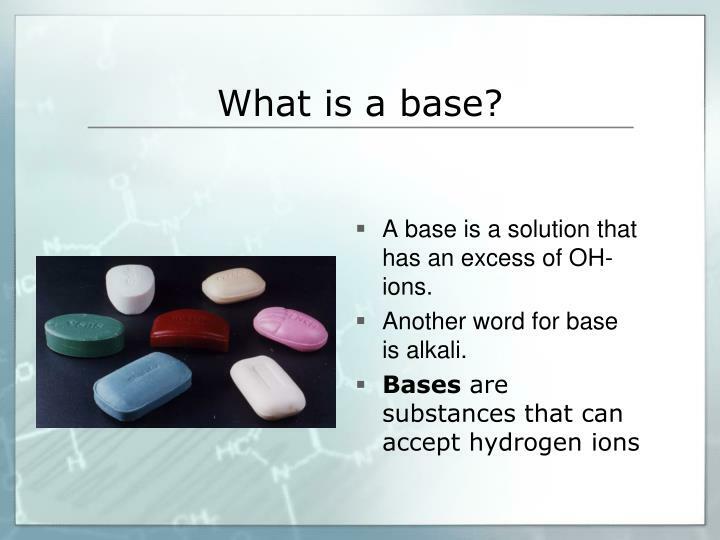 A base is a solution that has an excess of OH- ions. 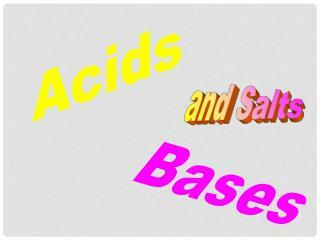 Another word for base is alkali. 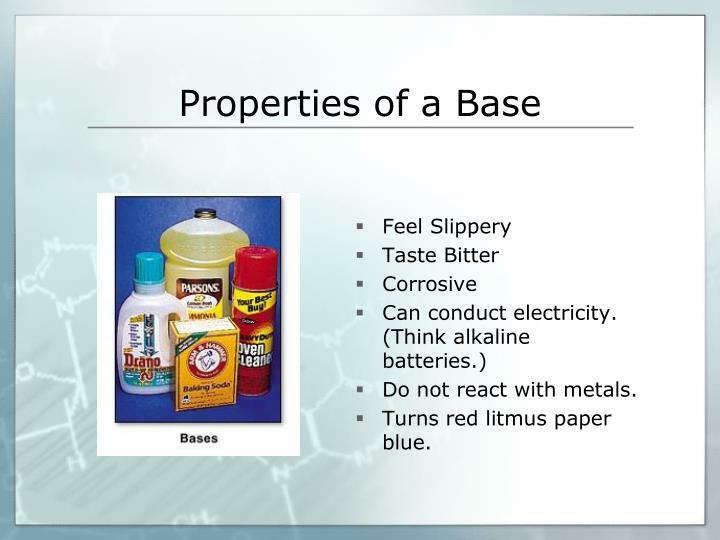 Do not react with metals. 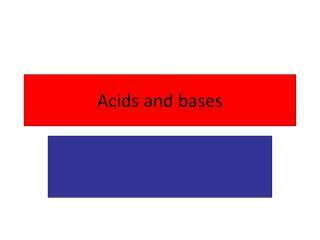 Turns red litmus paper blue. 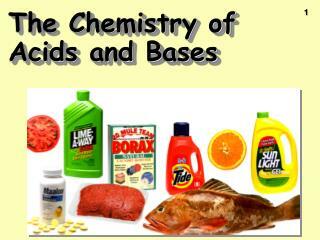 Bases give soaps, ammonia, and many other cleaning products some of their useful properties. 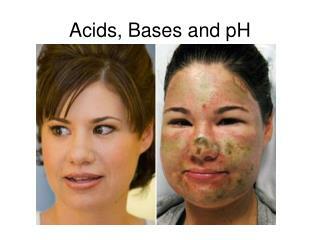 The OH- ions interact strongly with certain substances, such as dirt and grease. 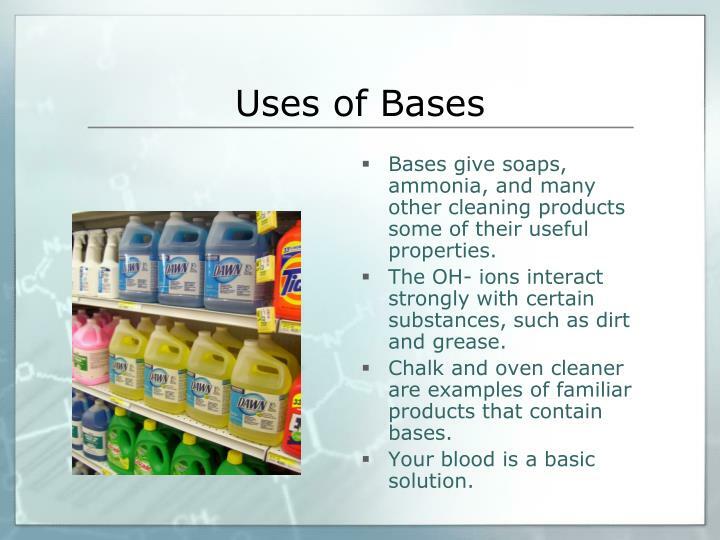 Chalk and oven cleaner are examples of familiar products that contain bases. 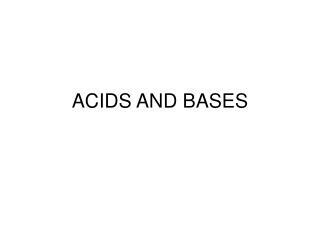 Your blood is a basic solution. 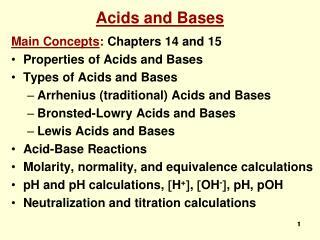 pHis a measure of how acidic or basic a solution is. 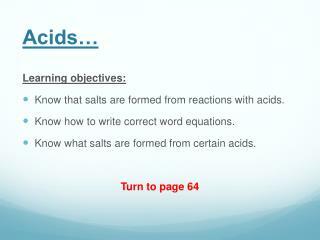 A solution with a pH of 0 is very acidic. 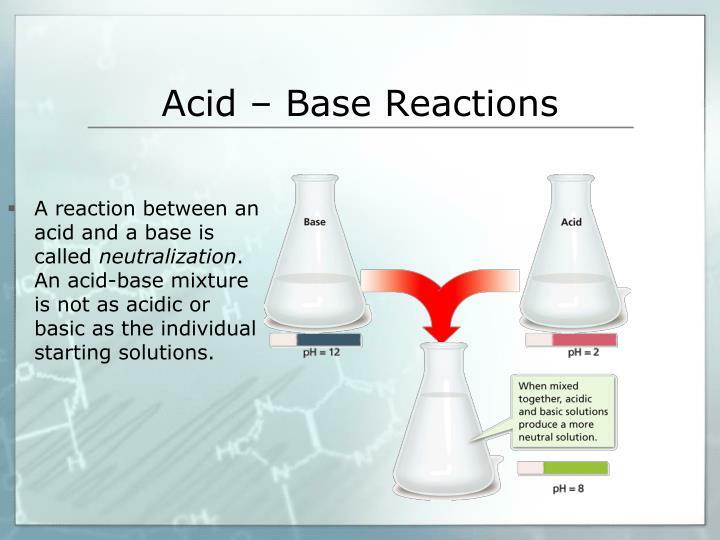 A solution with a pH of 7 is neutral. 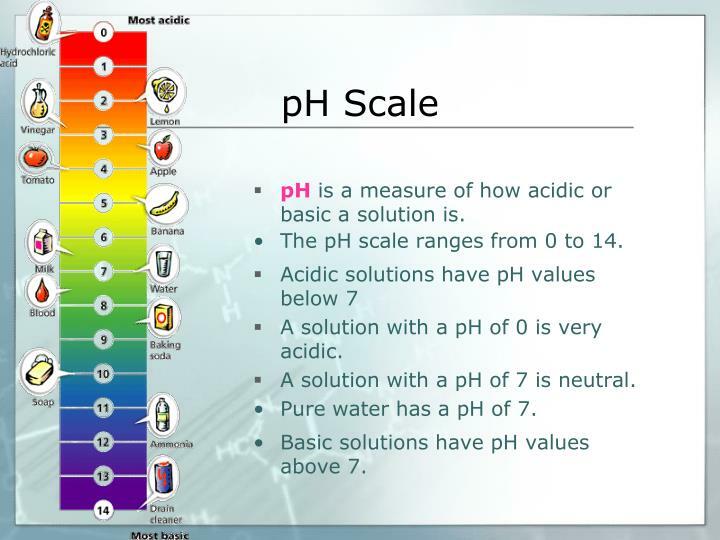 Basic solutions have pH values above 7. 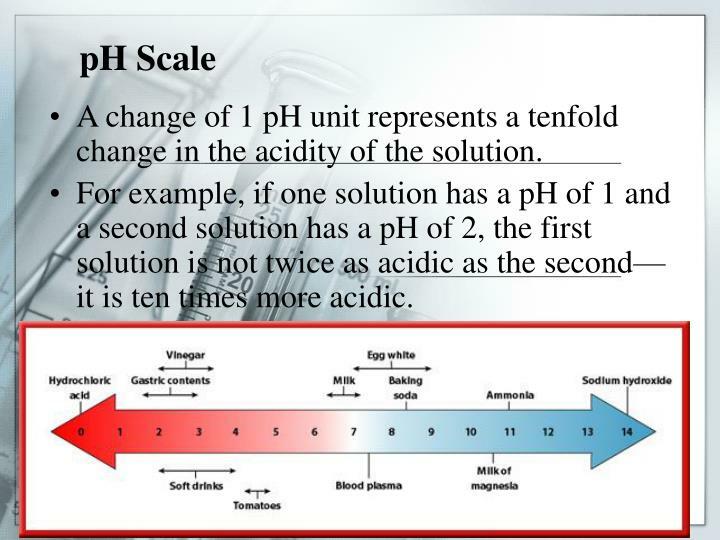 A change of 1 pH unit represents a tenfold change in the acidity of the solution. 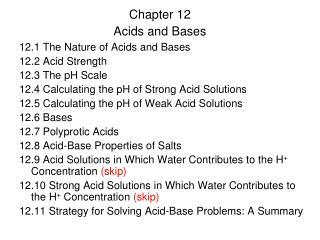 For example, if one solution has a pH of 1 and a second solution has a pH of 2, the first solution is not twice as acidic as the second—it is ten times more acidic. 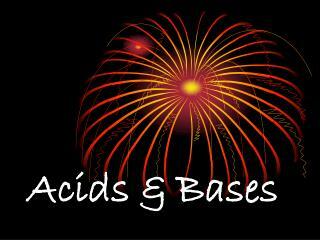 A reaction between an acid and a base is called neutralization. 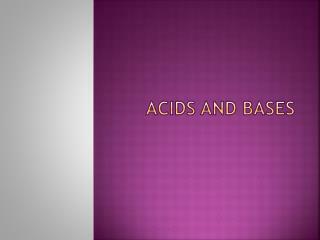 An acid-base mixture is not as acidic or basic as the individual starting solutions. 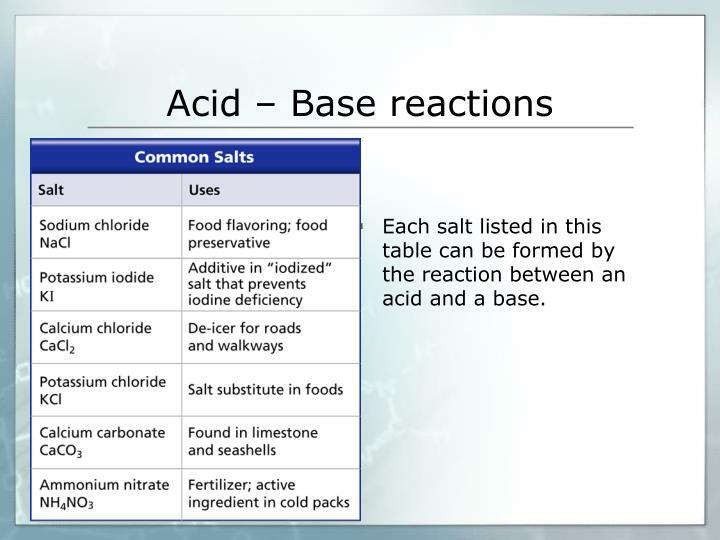 Each salt listed in this table can be formed by the reaction between an acid and a base.